To reduce to a few hundred words the life story of an almost mythic figure is not an easy task. It can be said, without fear of exaggeration, that Buenaventura Durruti symbolised in his person the courageous struggle of workers and peasants in that country, and more specifically symbolises the spirit of Spanish anarchism. He was born the son of a railway worker on July 14th 1896 in Leon, a city in central Spain. Aged 14 he leaves school to become a trainee mechanic in the railway yard. Like his father, he joins the socialist UGT union. He takes an active part in the strike of August 1917 when the government overturned an agreement between the union and the employers. This soon became a general strike throughout the area. The government brought in the army and within three days the strikers had been crushed. The troops behaved with extreme brutality, killing 70 and wounding 500 workers. 2,000 strikers were jailed. These years see him involved in several strikes and being forced into exile. Unwittingly the Spanish government 'exported' rebellion, as Durruti and his close friend Francisco Ascaso happily joined the struggle for freedom wherever they ended up, in both Europe and Latin America. The Spanish monarchy fell in 1931 and Durruti moved to Barcelona; accompanied by his French companion Emilienne, pregnant with their daughter Colette. He joined the Iberian Anarchist Federation (FAI), a specifically anarchist organization, and together with other militants they form the 'Nosotros' group. These were members within the CNT of a radical tendency that harboured no illusions with respect to the recently proclaimed Republic, maintaining that the moment was ripe for continued progress towards a social revolution. With the electoral victory by the liberal/reformist Popular Front in February 1936, Left and Right were on a collision course, initiated very rapidly by Franco's military rebellion on July 19th 1936. The CNT and the FAI confronted the army with courage, organisation and mass mobilisations – this was the Spanish Revolution. They triumphed in much of Spain despite the fascist superiority in weapons and resources. The anarchist contribution was decisive in resisting the fascists throughout the country and in Catalonia defeated the rebels single-handedly, Durruti being one of the boldest fighters in this battle. It was here that Francisco Ascaso lost his life. On July 24th, from Barcelona where the anarchist goal of workers' control, direct democracy and liberty was starting to be a reality, Durruti left with an armed column towards Zaragoza, occupied by the fascists. Through hard battles this workers' militia, without officers or other military trappings, advanced and saved the Aragon front against much better equipped regular troops. Parallel to this, the anarchist forces supported a social transformation which meant the establishment of agricultural collectives in Aragon, upsetting the authoritarians of the Communist and Socialist parties, according to whom the war could not be won with the revolution going on. War or no war these would-be rulers would never have liked a real workers' democracy. 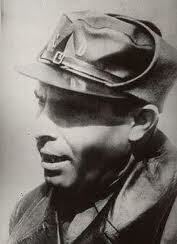 After the liberation of Aragon, Durruti was interviewed by Pierre van Passen of the Toronto 'Star'. "For us" said Durruti "it is a matter of crushing fascism once and for all. Yes, and in spite of the government. No government in the world fights fascism to the death." When the bourgeoisie see power slipping from its grasp, it has recourse to fascism to maintain itself. The Liberal government of Spain could have rendered the fascist elements powerless long ago. Instead it compromised and dallied. Even now at the moment there are men in this government who want to go easy on the rebels. "We know what we want. To us it means nothing that there is a Soviet Union somewhere in the world, for the sake of whose peace and tranquillity the workers of Germany and China were sacrificed to fascist barbarians by Stalin. We want revolution here in Spain, right now, not maybe after the next European war. "We are giving Hitler and Mussolini far more worry with our revolution than the whole Red Army of Russia. We are setting an example to the German and Italian working class how to deal with fascism." But, interjected van Passen, even if you win "You will be sitting on a pile of ruins". Durruti answered "We have always lived in slums and holes in the wall. We will know how to accommodate ourselves for a while. For, you must not forget, we also know how to build. It is we the workers who built these palaces and cities, here in Spain and in America, and everywhere. "We, the workers, can build others to take their place, and better ones! We are not in the least afraid of ruins. We are going to inherit the earth, there is not the slightest doubt about that. The bourgeoisie might blast and ruin its own world before it leaves the stage of history. We carry a new world, here, in our hearts. That world is growing this minute". Durruti embodied the feelings and goals of the workers in arms, being a peculiar "chief" whose main privilege was to fight in the first line and whose only rank was the esteem his equals had for him. His courageous life came to an end in November of that same year. On the 15th Durruti arrived with a force of 1,800 men to reinforce the defence of Madrid, where they went immediately to the toughest section and on the 19th he was struck by a bullet. He died at dawn on the 20th, being buried two days later at Montjuich's cemetery in Barcelona, his coffin accompanied by 500,000 people carrying the red and black flags of anarchism (see picture, below). It was the largest funeral cortege ever seen in that city.